Effectively running digital marketing campaigns across several marketing channels requires large teams with various disciplines. Sure, you can get a “jack of all trades” but these team members are forced to be generalist instead of specialists as they’re stretched across many disciplines – a recipe for mediocre performance. Running digital marketing campaigns are one thing, but making them smarter in real-time is a whole other ball game. At Alley, our team works relentlessly to push the envelope in the big data space making sure we’re building out technologies that ensure we can acquire customers with the highest lifetime value and the lowest cost per acquisition. Because of our data engineers, data partner network and economies of scale through having various clients in different industries we’re able to test and optimize our solutions more rapidly than a single in-house team could even imagine. Finally, reporting…oh, good ole’ reporting. One of the most important parts of any marketing campaign yet the bane of existence for almost every digital marketer. Don’t worry, we have that covered for you too. Login into your portal to see campaign results and work with your Account Strategist to pull away deep insights. We’ll even make it easy for you to share with superiors and teammates, making you look like a rockstar (because you are)! Our goal is to reach your goals, so we work to seamlessly integrate with both your internal and external teams in order to take your online customer acquisition to the next level. So take back your time, save your headaches, put your budget back into media and let us show you what we can do for your business. All of Alley’s solutions are fully managed. That’s right, we take can care of everything from start to finish. Which means you save time while maximizing campaign performance. Your very own go-to mastermind for all of your campaigns. Our Account Strategists have deep experience in running conversion-focused marketing campaigns. They have a wealth of knowledge and are happy to answer any questions you may have relating to the campaign or anything else. Got a question about an article you read about the “Cookie Monster trend”? Ask your Account Strategist! Alley’s proprietary solutions are the “secret sauce” behind our success. We’ve taken over 50 years of collective digital marketing experience to formulate a system that utilizes big data, multi-touch attribution modeling and predictive algorithms across the entire customer life cycle, allowing us to most effectively drive both new and repeat customers with the highest lifetime value. By combining our real time algorithmic predictive intelligence with the micro-bid management techniques of our Digital Marketing Experts, your campaigns are able to reach higher ROI at a much faster rate. 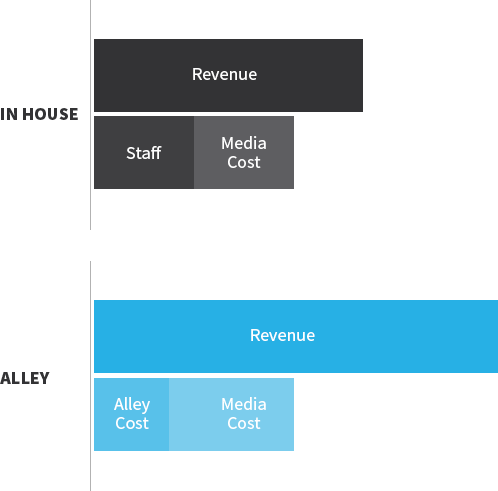 This allows us to quickly target top performing segments and ultimately eliminate wasted media spend. Log into your Report Portal to check the pulse of your campaigns at any time or work with your Account Strategist to gain a more in-depth analysis with actionable insights. In addition, learn about the profiles of your best customer segments, their preferred ad messaging and creative content for you to utilization in other off-line marketing campaigns. Let's be honest, no amount of technology and experts can help bad ad creative and copy. Don't worry, we can help with that. We are happy to assist your internal design team with marketing angles, promotions and online ad best practices. Don’t have an internal design team? Not a problem – our expert Designers can create conversion-focused designs that don’t sacrifice your brand guidelines. Campaigns don’t end after the user has clicked. We analyze your site’s conversion rates and offer data-based recommendations. When necessary, we will implement multivariate landing page tests to ensure our off-site campaigns are just as successful on-site. Bottom line: increased customers, increased orders, and increased revenue.